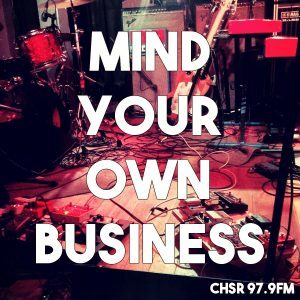 CHSR-FM 97.9 | Mind Your Own Business // It’s Never Too Late!Mind Your Own Business // It's Never Too Late! Home » Current Shows » Spoken Word Shows » Mind Your Own Business » Mind Your Own Business // It’s Never Too Late! In Episode 004, local musicians Jaclyn Reinhart and Colin Fowlie admit to being late bloomers in the music scene, but both are determined to make music their career! Reinhart and Fowlie both chat about getting into the scene late and figuring out exactly where they fit in. It can be intimidating to give something new a shot, especially in front of those who have been doing it awhile already. Learn from these two how to maybe make it easier on yourself, and where you can find some good resources. You can find out about their monthly songwriting group HERE.